This turmeric roasted carrots recipe is a simple side dish that wins every time! 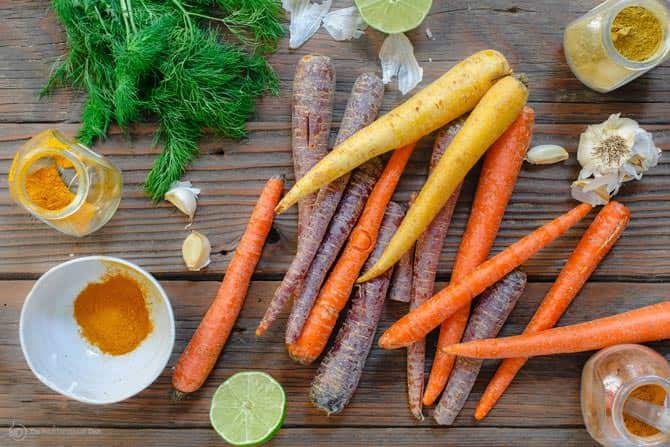 Whole roasted carrots prepared the Mediterranean way–with extra virgin olive oil, lime juice, garlic, and spices like turmeric and cinnamon. Vegan and Gluten Free. 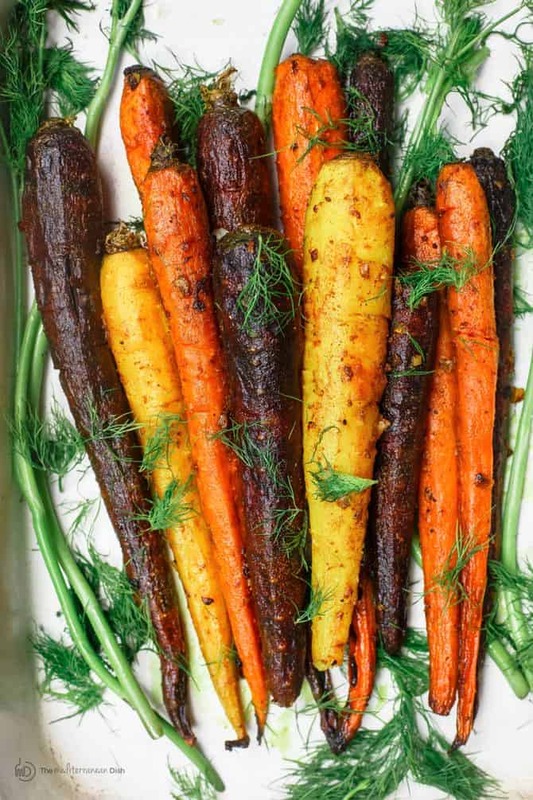 Today’s roasted carrots recipe almost begs us to forget what we know about cooking carrots. No slicing. No cutting into pieces. No boiling. 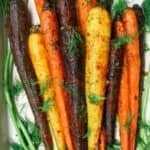 We’re going for whole roasted carrots, which make a wonderful statement on the dinner table (especially the colorful variety) with half the effort! When roasted, the warmth and sweetness of carrots comes through nicely. A little fat of sorts plus a pinch of salt and pepper may be all you need. My fat of choice here is obviously extra virgin olive oil, which will help our bodies absorb more of the vitamin A from the carrots. To add flavor and amp up the health benefits, I chose to toss the carrots in some ground turmeric, cinnamon, and coriander. 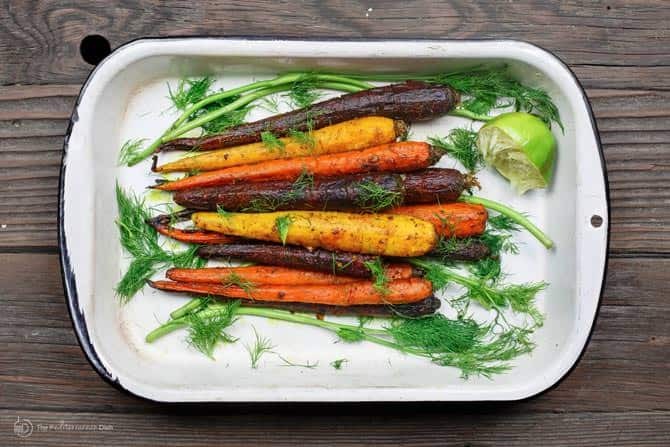 I like to finish my roasted carrots up with a squeeze of lime juice and fresh herbs, a little Mediterranean trick that brightens this dish up just right. Arrange the peeled carrots in a single layer on a large lightly-oiled baking sheet. Add 2-3 tbsp olive oil. Add the spices, salt and pepper, and minced garlic. Toss to combine. Bake in the 400 degrees F heated-oven for 40-45 minutes or until the carrots are fork-tender and caramelized or browned in some parts. Remove from the oven. Arrange on a serving platter and add the lime juice and fresh dill or parsley for garnish. Enjoy! Thanks for sharing this healthy and delicious recipe. My mom always looks for easy-to-make recipes that contain a lot of nutritional benefits. Also, she’s into cooking foods in an oven these days, so I would definitely recommend this to her. 2. If I wanted to prep them in advance do you think it would be bad to peel the carrots the day before? Or to prep them (with oil and spices the morning of and then refrigerate until ready to cook at dinner time? Hi Kate, you can peel the carrots the day before and refrigerate in a large freezer bag (sometimes, I’ll wrap them in paper towels and then place in sealed bags in the fridge.) I typically just spice them up before roasting, but I don’t see the harm in trying your idea of preparing them earlier. If you do that, I would use a glass or ceramic baking dish perhaps. Hi Kelsey. I haven’t tried the slow cooker myself, but have done a quick search and I think it’s totally doable. Once you spice them up and be sure to toss them well in the olive oil (or you can do a little butter I suppose if you need to for the slow cooker.) Place them in the slow-cooker and cook on high for like 4 hours, but do check after 2 hours or so and turn them. If you think a little liquid would help, perhaps a 1/2 cup broth or so at bottom of slow cooker before adding the carrots. Roasted carrots do have a different taste though. Hey! I’m not a huge fan of coriander and am wondering if I can simply leave it out without it affecting the recipe too much? Yes, you can leave it out, Tammy. And if you feel like adjusting the remaining spices to compensate, that’s fine. Feel free to play with the flavors to your liking! This was delicious! Thank you for the excellent recipe. I served it with Ottalenghi’s chicken with carmelized onion and cardamom rice. Sounds like a great pairing! Thanks for sharing. Could I use lemon instead of lime? I made this Turmeric Roasted Carrots recipe for the first time for Thanksgiving and everyone loved them! They came out great! The carrots I used were very large, so I had to cook them for an extra 5 minutes, but they were excellent! That’s wonderful, Dawn! Thank you for giving them a try. This dish sounds amazing, roasted carrots are so good and tumeric and cinnamon? Yum, both those spices have so much flavor and are GOOD FOR US! natural, whole and fulfilling foods help our metabolism to operate properly, and keep us healthy. Thanks, Maria! I’m glad you like this recipe. And so true…some great-for-us spices in here! What would you serve with these amazing carrots? these flavors look wonderful, love the idea of olive oil, lime juice, dill and cinnamon, among others! thank you for sharing this, another side dish taken care of! Awesome, Sabrina! Glad you like it! Thank you! Glad you like the idea. Hope you do try these carrots soon! Oh my this looks amazing! I am so ready to prepare foods such as this for my family!! thanks you for all the wonderful dishes you bring .. I have a lot hate relationship with carrots – sometimes I love them, but then there was a period where I just could not eat them. Back to loving them currently so will have to try this! Just got a bag of multi colored carrots at the store yesterday! Oh my! Those look sooooo good. Easy, too. I’m loving all the great, low cal finger food/snack ideas I’m getting from everyone lately! Thanks so much, Dan! Glad to see you here. 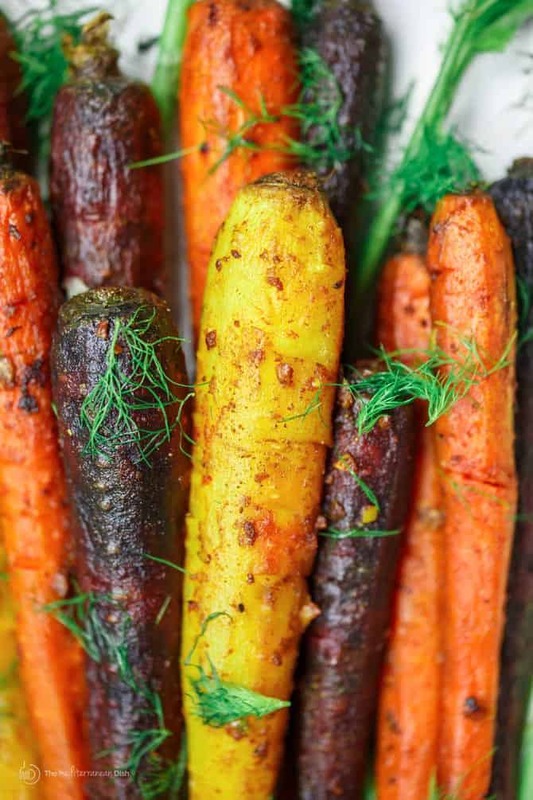 We love roasted vegetables, especially carrots, as the flavor is so great. Love your combination of spices. I can taste the lime and dill garnish on these just by looking at your photos! Oh, thanks a bunch, Linda! Love carrots this way! What gorgeous, colourful carrots and I love the way you have prepared them. You’ve used a really lovely combination of spices and I can just imagine how delicious they taste!